Manila, Philippines - Darren Espanto performed Jessie J's song "Domino" during the blind audition episode of the popular ABS-CBN's reality show aired on Sunday, June 1, 2014. The 12-year old kid from Calgary, Canada amazed Coach Sarah Geronimo and Bamboo Manalac. "I think I can help you and groom you to be a recording artist, a total package. ", Bamboo said to Darren. To recruit Darren, Sarah sang and danced with him. Darren picked Team Sarah as according to him the Popstar can help him a lot in the music industry. 'Darren Espanto' immediately trended no. 1 on Twitter Worldwide Sunday night. Darren also auditioned for Canadian reality singing competition 'The Next Star' when he was 10. He was among the Top 6 finalists of Season 5 of the YTV reality series. Brooklyn Roebuck of Ontario won in the said show. 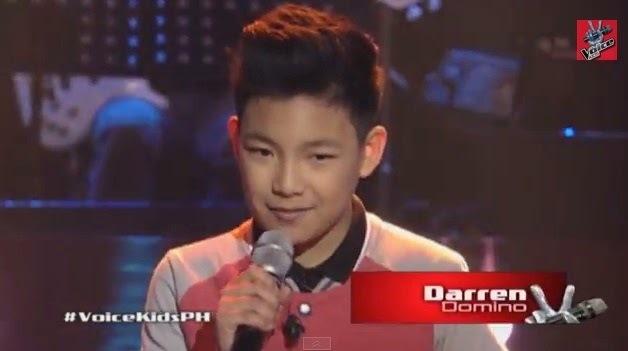 Darren was a champion in an Edmonton- based talent search called Pinoy Singing Sensation (PSS) in 2011.